Now, as we've seen Princess Stephanie's amazing gown, It's time to start celebrating what our royal ladies have worn to the wedding ceremony. And because I'm so thrilled today that we had this Elie Saab gown, there won't be thumbs down this time as well. As announced Grand Duchess Maria-Teresa was dressed by NATAN, Although she usually looks way better in Elie Saab, I really appreciate that she didn't go for one of his designs as it would be a kind of "competing" with the bride, She wore huge brooch which is impressing unless if it's costume! Her hat is by Fabienne Delvigne. Lydia de Schaetzen chose a lighter shade of pink, she arrived with the grand duke. Princess Claire wore a whole maroon/brown ensemble that reminds me of a look from Dior's latest collection, hat by Fabienne Delvigne. Mathilde went for flashy bronze which she accessorized with grey hat and a clutch with some colorful stones, Hat by Fabienne Delvigne. Maxima went for a rather simple look (Compared to last night), but as a magpie, she didn't disappoint and wore a crazy hat by Fabienne Delvigne. Tessy went for a simple but elegant dress with an interesting back, which makes me feel that we're gonna hear some good news soon, also her hat was by Fabienne Delvigne. Antonia Hamilton and Princess Alexandra were both the bridesmaids and both of their dresses were designed by NATAN, They give me that nostalgic vibe of Princess Grace's bridesmaids, I prefer Antonia's myself, better view of the two dresses here and here. Queen Paola looked okay in her grey dress, hat by the same hat designer as above. Princess Marie looked so classy in her outfit as well. Princess Caroline of Hanover opted for a lovely dress from the Fall 2010 Couture collection from Chanel. I don't really like the veil on the hat though! Countess Sophie of Wessex wore a lovely Emilia Wickstead dress with horse print, Shown above another version of the dress since Sophie's is bespoke, hat by Jane Taylor. Princess Mette-Marit of Norway wore a Valentino coat with beige heels, dark purple dress underneath, and some weird hair wrap, breads thingy! L to R: Princess Letizia of Asturias, Princess Clotilde Courau, Princess Marie-Chantal, Princess Martha-Louise of Norway, Princess Victoria of Sweden, Queen Anne-Marie, Queen Sonja, Princess Miriam of Hungary, Princess katherine of Yugoslavia(down), Princess Astrid of Belgium. Princess Letizia chose Felipe Varela (as always) and the result was beautiful although kind of blergh! Princess Clotilde wore and Elie Saab dress, and some fascinator! 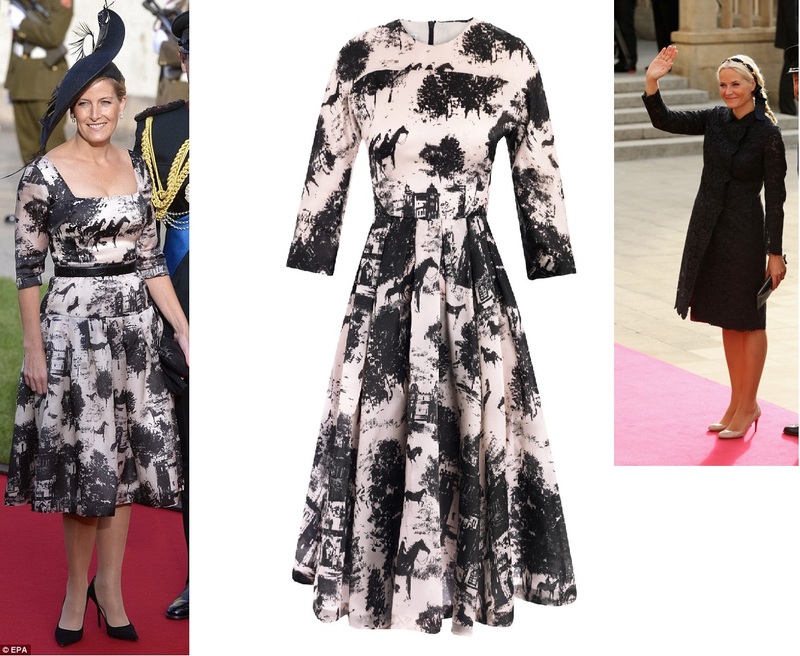 Princess Marie-Chantal wore a beautiful dress, remind me of some looks from Akris, but I really hope it's not! Martha-Louise looked beautiful in a grey/silverish dress. She's been looking good recently, and that's questionable! Princess Victoria recycled her Fadi El Khoury couture dress she wore earlier this year (she got that thing on the shoulder removed) and added a new gorgeous grey coat! Queen Anne-Marie looked every inch a queen in her dress and coat combo. She wore that dress before, didn't she? Queen Sonja looked okay, but the white stocking were rather an unfortunate choice. Princess Miriam looked great, I'd really like to know the designer. Princess Katherine looked exactly as she looks in every wedding. I really loved Princess Astrid's outfit, there's something Dior-ish and fifties-ish about it, good job! 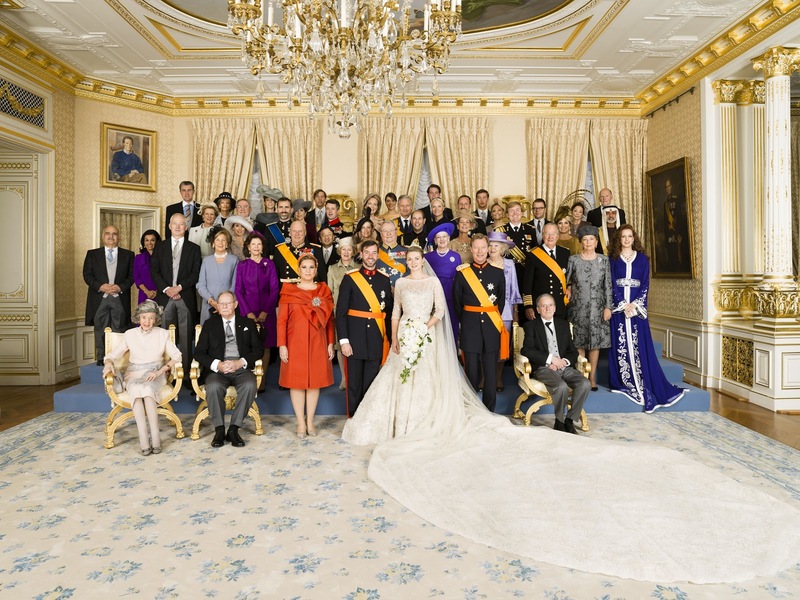 Left to right: Princess Mary of Denmark, Queen Silvia of Sweden, Queen Beatrix of The Netherlands, Princess Margaretha of Liechtenstein, Queen Margarita, Princess Sarvath, Queen of Margrethe, Princess Lalla Salma, Princess Margarita, Nora de Liechenstein. The rule says, give it some color and you're a winner! And so all these women are winner, and while I really like Mary's outfit, Lalla Salma is the biggest winner here. 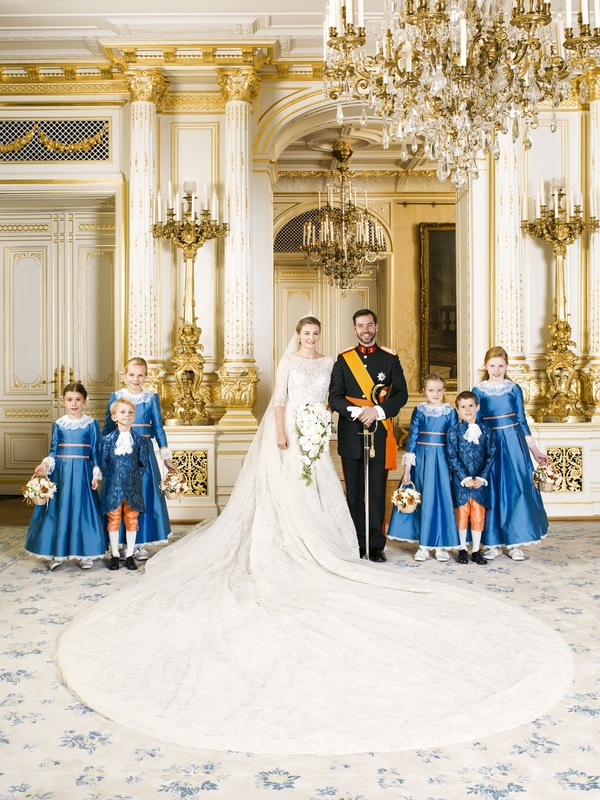 The Ducal Palace has released the official wedding photos of Prince Guillaume and Princess Stephanie (Countess of Lannoy) that were taken by Christian Aschman. Tell me what you think of the guests' outfits and the official photos! I did not like the dresses of the older Bridesmaids, Princess Alexandra and Antonia Hamilton. Princess Alexandra's particularly was poorly thought out. After all her work with the Bride's train, I saw that she needed help from Antonia right before walking down the aisle to adjust the back and shoulders. I saw her bra strap also while she was bending down to adjust the train and several other times she had to pull up the shoulders. Most unfortunate. Letizia and princess Caroline looked the best! the bigger bridesmaids and blue flower girls dresses did not work at all!!! very pair choices! Princess Stephanie of Hanover, Monaco looked like she needed a meal... poor woman's looking terribly thin. Was her husband Ernst in attendance? It's Princess Caroline of Hanover, not Stephanie. Stephanie is her sister. Doubt her husband Prince Ernst was not there. They are seperated and he would probably embarass himself if he attended. I agree she is terribly thin, and the colour of the dress a bit boring. Miriam de Hungria is wearing,as usual, an outfit signed by Ladrón de Guevara. He's a spanish designer, not very known outside Spain. Oops, I meant Miriam Ungria, wife of Prince Kardam of Bulgaria.